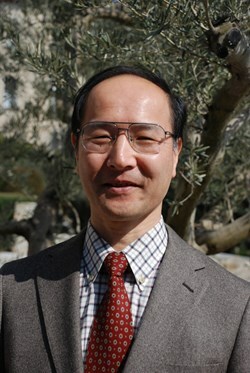 Kiyoshi Okuno, JA-DA Liaison Officer to ITER. Kiyoshi Okuno has been allotted temporary office space at ITER Headquarters, but you're unlikely to find him there if you knock. As Liaison Officer for the Japanese Domestic Agency (JA-DA), he spends his day in pursuit of solutions to the technical and administrative issues that arise relating to Japan's procurement for ITER. Okuno is based at the JA-DA Headquarters in Naka, Japan where he is Responsible Officer for Japanese magnet procurement. Magnets represent the largest portion of Japan's engagements for ITER; on these long-lead items, procurement is already in motion. "On behalf of the JA-DA, I interface with ITER on the one hand," explains Okuno, "and with Japanese industry on the other." Okuno is the second Liaison Officer from the JA-DA, following Kenichi Ueno who returned to Japan last month. During his five-week stay at ITER, Okuno will be addressing important issues related to magnet as well as other Japanese procurement, working closely with ITER colleagues in Cadarache. Japan is responsible for procuring 100 percent of the central solenoid conductors, 25 percent of toroidal field conductors, and a share of toroidal field coils. Okuno's expertise in magnets is the result of a life-time career spent in the field. Following a Master's in Nuclear Engineering at the Tokyo Institute of Technology in 1979, he joined the Japanese Atomic Energy Research Institute (now the Japan Atomic Energy Agency), where he conducted research on large-scale and high-field superconducting magnets, and niobium-titanium and niobium-tin conductors. From 1985-1987 he was put in charge of the Large Coil Task project at the US Oak Ridge National Laboratory, which involved the USA, Japan, Euratom and Switzerland. In this ITER-like collaborative experiment, six different D-shaped, steady-state coils were separately designed and built by the participants, and shipped to Oak Ridge for extensive testing. The designs all worked well, proving that huge superconducting magnets were feasible for large applications such as ITER. Okuno returned to Naka to oversee another magnet testing project—this time for pulsed magnet technology similar to ITER's central solenoid. The Japanese Demo Poloidal Coil (DPC) project was in its design phase; Okuno managed the project throughout fabrication and operation. He joined the Engineering Design Activities (EDA) for ITER at the Naka Joint Work Site in 1992, where he worked side-by-side with the current head of the Magnet Division at ITER, Neil Mitchell. Okuno had operating responsibility for the toroidal field and central solenoid model coil programs, and was acting group leader for the full-scale coil project. He worked closely at the time with the other ITER Joint Work Sites in San Diego and Garching. In 2001, Okuno became Head for the Superconducting Magnets Laboratory in Naka, whose main objective was to advance R&D for ITER magnets and to prepare for procurement. "Between the design of the magnets and their manufacture," emphasizes Okuno "there is a lot to do. Following the signature of the Procurement Arrangement, we need to establish detailed manufacturing designs." Okuno has authored several major scientific papers on magnet-related topics. "I have been involved with ITER, and before ITER with large magnets, for decades, and I hope to still be around to see the project come to fruition," says Okuno. There's nothing simple about the ITER Project ... but I can definitely say that with strong will and effort, we'll be able to overcome the obstacles and succeed."